We’re back! 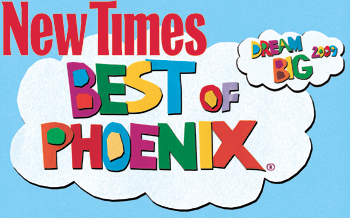 After being on hiatus for much of the year, Improv AZ is back in action. It feels so good to be doing flash mobs and pranks again! 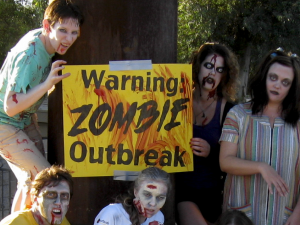 There are a lot of organized zombie walks these days, but we wondered what people would do if a zombie outbreak happened somewhere they really didn’t expect? On Saturday October 20th, we organized a small group of pranksters to invade the Arizona canal to scare and entertain unsuspecting runners. We picked a section of the trail that’s a common route for runners and bikers who are training for races this coming winter. 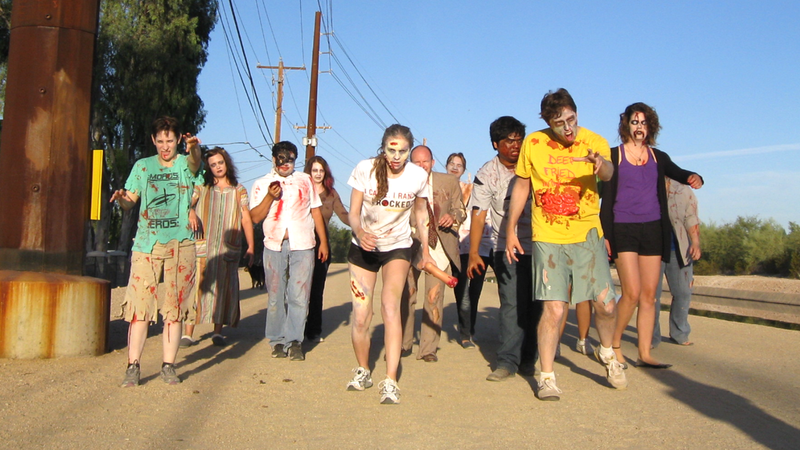 We thought a little Zombie outbreak might give them some extra… motivation… to run fast! Thirteen zombies gathered at 6:45 am near the canal at to put the final touches on our costumes. We paled our skin, blackened our eyes, and covered ourselves with gooey blood, fake wounds, and ripped clothes. We hung a big yellow signs smeared with blood at end edges of the zombie invasion area: Warning: Zombie Outbreak. The invasion began at 7 am! This guy did NOT want to be zombified! 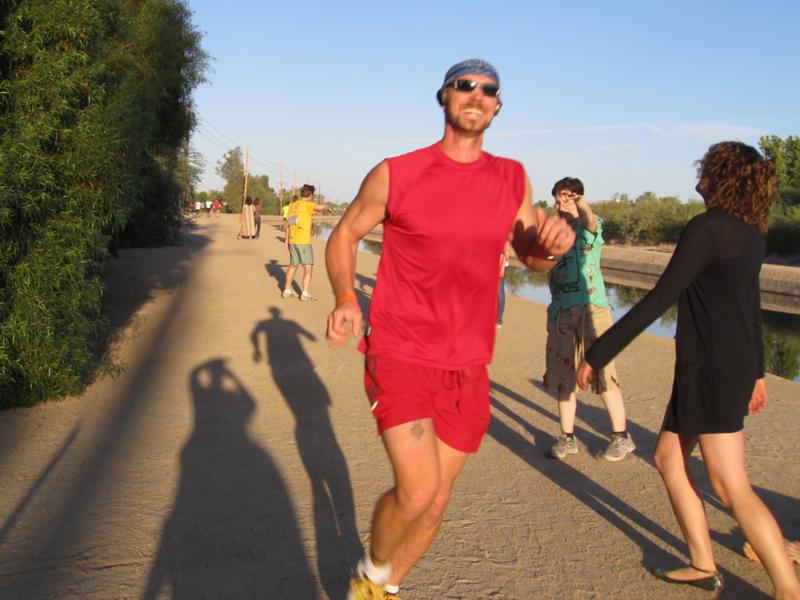 Due to the angle of the sun, some runners couldn’t see more that the outlines of our bodies shuffling towards them with arms raised as they approached. It was only when they got closer that they could see our pale skin and still-wet blood. One guy seemed genuinely disturbed by the zombies around him despite the fact that he towered over everyone in our group. We think he might have had zombiphobia. Two runners split up when the first runner labeled him the slower of the two, and thus the better candidate for our breakfast. His friend took proved him wrong by taking off at a speed that would have put the Road Runner to shame! We also scared a few dogs. We probably smelled funny. The zombie invasion lasted until about 7:30 when our bodies were sore from limping and our throats hurt from moaning and grunting. We took some great zombie pictures and dispersed just as fast as we assembled. If this is the first time you’re hearing about this event, that’s because this was a secret flash mob that we only announced to our mailing list. If you want to get involved in future events, get on our email list! Thanks to everyone who participated in the Zombathalon, and all the runners we had fun with so early in the morning. We hope we made your run more interesting!